I've got a latte and a handful of chocolate chips. I'm sick; I should be drinking water and eating, I don't know, ginger root and cloves of garlic. But if there is one thing I know about being an adult, it's that I'm not any smarter than I was as a kid, I'm just more aware of my stupidity now. And there is no one here to enforce wisdom. Tale as old as time. C'est la vie. Viva Las Vegas. I organized my bookshelves today. Reorganized them. Before, they were arranged by genre and then by colour within the genre. But lately, I've been looking at them and thinking, "This is very 2008 of me, this whole rainbow book thing." Plus, my book collection is getting...big. I bought 14 books the other day (more on that later) (or, if you follow me on Instagram, more on that before). So today I took them all off the shelves, piled them in stacks all over the couches and piano bench and chairs and coffee table and floor, and sorted them into genres and then by the authors' last names. Sully helped, and that was cute and fun. I like this better than the colour thing, I think. Fiction A-B is on top of the piano. Fiction B-T is on the left bookcase. The bottom shelf on that side is taller and has my cookbooks and music books. 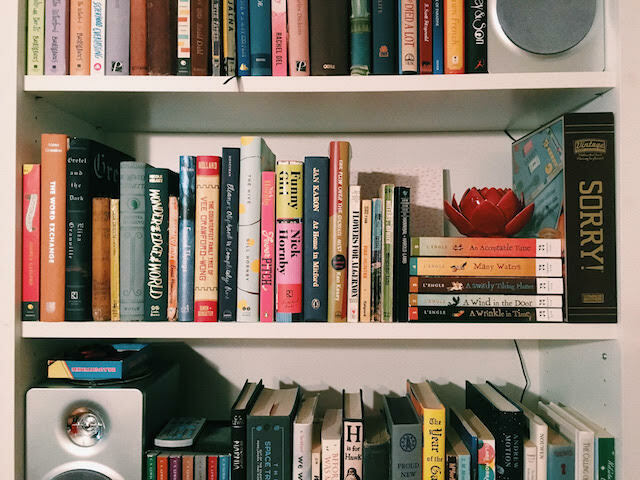 The right side has non-fiction, divided into categories, and then a tiny memoir section, and then a short stories and poetry section. Then there are coffee table books (I love a good coffee table book), and then young adult fiction, and then textbooks. Fiction T-Z, in case you were worried, ended up on the shelf behind the couch, because that's what makes sense for me for now. This is the thing I like about book organization: it only has to make sense to you. You're the only one who has to like it or find it useful. And, I mean, that's true of all home organization/decor things. It's just that now we have Pinterest and design blogs and now we're aware of all these rules about fashion and function and the "right" way to hang pictures and arrange furniture. You know what I say to all of that? Well, hey, here, I just so happen to have a helpful analogy! I'm sick. I should be eating ginger and garlic and drinking water, but I'm having a latte and chocolate. I am fully aware of what I'm doing "wrong" and I really couldn't care less, because I'm happier with chocolate than garlic cloves, and I will survive. And that's how I feel about home decor.